*** This post contains affiliate links from the Grammarly affiliates program. As an affiliate, I will get a small commission if you subscribe to Grammarly (free or premium version) through the links displayed in the post below. Everything is in the title! As a French girl living and working in London and a French blogger writing in English, I let you imagine, that Grammarly has been pretty much my best friend in this journey! I found out about Grammarly randomly when I saw one of its ads appearing before a YouTube video. “A free writing assistant”, what?! As a non-native English speaker, I had to check it out. It didn’t take Grammarly long to convince me, that I needed it! At the end of the ad (which I watched until the end! Something that generally never happens), I created a free account and installed the free extension on my computer at work. At the time, I just thought: Let’s give it a try and if it’s not as good as it seems to be, not useful or if I just don’t like it, then I’ll cancel it. As simple as this! And I still have it on my computer, because it’s doing the job perfectly and the app is really user-friendly! Believe me when I say I’m glad I found this advert on YouTube! This is exactly what I needed to feel more confident about sending important emails to my picky managers or external clients at work. I ended up installing it on my computer at home the same day and it became my blogging buddy as soon as I started blogging! I would definitely recommend Grammarly to whoever is not a native English speaker, whoever doesn’t feel 100% confident when writing in English (no matter what content it is) or whoever who would just want another proofreader for important documents, for instance. First of all, it’s free, so you don’t really risk anything by giving it a try, and second of all, it also feels reassuring to have a second pair of eyes, which is constantly proofreading your content, emails and documents. Grammarly is an automated grammar checker, which means that it will check the mistakes automatically while you’re writing. When you create a document in your account, all mistakes will be underlined in red and when you put your cursor on top, Grammarly will suggest you corrections. The good thing is that it takes the context into account, which makes a huge difference because the suggestions you are shown are actually useful. Please note that if you download the extension, it works the same way (underlined in red and corrections are suggested). The only difference is that you don’t need to create a new document in the app. You can just write in whatever mailbox, social media (like Twitter or Facebook for instance) or website you want, the extension will activate if you need to correct something. So it’s even BETTER! It would also let you know if you forget or misplace commas, if you forget articles or if you misspell words. Repetitions of words would also be flagged and Grammarly would suggest you alternative options to replace the repeated word. I have to admit that the grammar checker is a really useful feature for me, as I’m writing a lot of content in a language that isn’t mine. After a long day, mistakes can easily slip in (same if I’m tired or distracted). If you’re like me who always have questions (Yes, I love to ask “Why?” all the time! ), then you will also really like the fact that Grammarly gives you explanations on your mistakes and the corrections. You can then learn from it and avoid it next time! For whoever would want something even more precise, advanced or with extra features, then you have the premium version of Grammarly (you would have to pay for this one). The premium version is perfect if you’re writing a dissertation or running a business. The premium version offers you extra features that can change everything! A pitch for a potential client? You’re already one step ahead of your competition! The first (and probably best feature) of the Grammarly premium version is … (drum rolls! )… the HUMAN PROOFREADER! Yes, you heard me right! You can get a human person to proofread your work! How helpful would it be for students who constantly have to prepare dissertations, presentations and paperworks? How valuable would it be for professionals who are preparing reports for important meetings or pitches for a potential future client.? The premium version also allows you to access the plagiarism checker. If you have any plagiarism in one of your texts, Grammarly will help you detect it in order for you to be able to do the necessary modifications (remove it or quote it). !!! A small reminder for everyone writing content: If you’re using someone else’s content, please always make sure to quote them in the right way to avoid any trouble !!! You have a lot of other features in the premium version, which you can find on the website of Grammarly here. Grammarly created a clear chart that explains what features are included in each version. Check it out if you’re interested in the premium version! 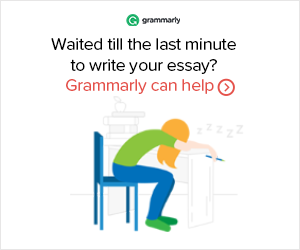 Once again, you can try Grammarly for free thanks to the free version! So if you’re not 100% convinced yet, then give it a try so you can see how great it is by yourself (I mean… You have nothing to lose after all!). I really hope this post was useful to some of you and I hope that the ones who will get Grammarly will find it as helpful as I did! If yes, what do you think of this app?! Prev Harry Potter Studio Tour – What to expect?! Next Nominated for the Sunshine Blogger Award! Thanks for the recommendation! I will have to check out Grammarly. I’m always looking for tools to help with my blog and make my writing better!! I’m happy that it could help! I know so many English native speaker (and bloggers) who also use Grammarly! Grammarly is also helpful for native English speakers. I use the website to check through my blog posts, just in case. It’s my best friend, too, and I’m English! 😂 I’m glad it’s helped you – this is such an in-depth and useful post about it. Good job! Same! Since I have it, I see it everywhere! But I understand why a lot of people get it: it’s soooo useful! I’m using Grammarly for more than 15 days now. Since the day I have read this blog. My pleasure!! I’m glad it helped you as much as it did for me! It’s really a useful tool to have when you write in English. I’m glad you came across my post!